When we first came across this painting it was titled Kit Fatigue; however, a closer examination of the verso revealed remnants of a label on the stretcher which suggested that Henty-Creer‘s original title was The Fatigue Party; a name we have re-instated. We have no reason to believe that this was not painted at the same time, and at the same camp, as its companion piece, Boots, Boots, Boots. Consequently, we think that this picture shows men from the Royal Artillery (Boots, Boots, Boots features the distinctive Royal Artillery flash insignia on the helmets) stationed somewhere close to the coast - the stretcher shows a Southern Railway label for Robertsbridge, in East Sussex, some ten miles north of the Channel. 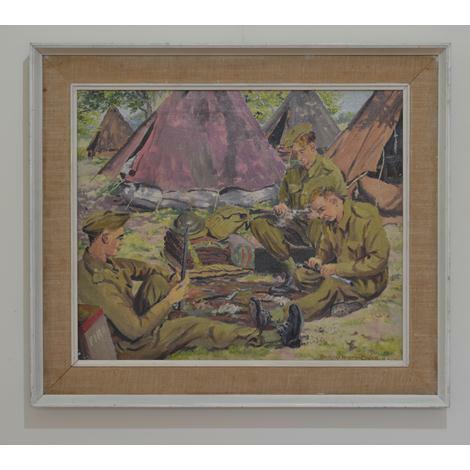 Perhaps depicting the preparations for a major military engagement (we are not sure of the exact date), this undemonstrative painting poignantly captures the mood of the men quietly engaged in the routine of preparation before action. 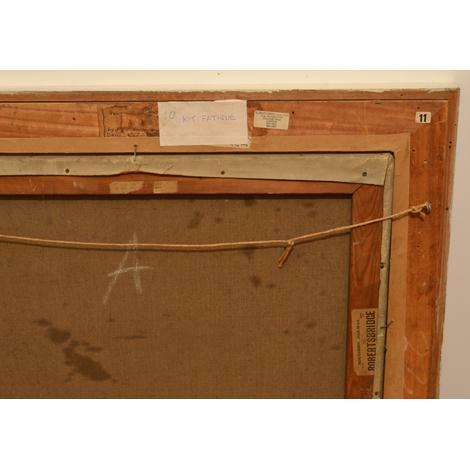 The painting is in what we believe to be its original - now slightly distressed - frame.